Perform with CD, MP3, USB, software, and iPod. MIXDECK is a complete system for every DJ who blends different kinds of music sources. Whether your music is on CDs, MP3 CDs, USB flash drives, iPod, your computer, or even other analog players, you can mix and perform with it all using MIXDECK. This performance station has the traditional two-decks-and-a-mixer layout you’re used to, but that’s where time-honored DJ tradition meets Numark innovation. MIXDECK has two large, touch-sensitive illuminated platters and controls for cueing and scratching your music. Each smooth, fast, reliable, slot-loading drive works with both CDs and MP3 CDs. You can also connect a USB flash drive on each deck for access to thousands of MP3s without taking a computer or CDs to the gig. 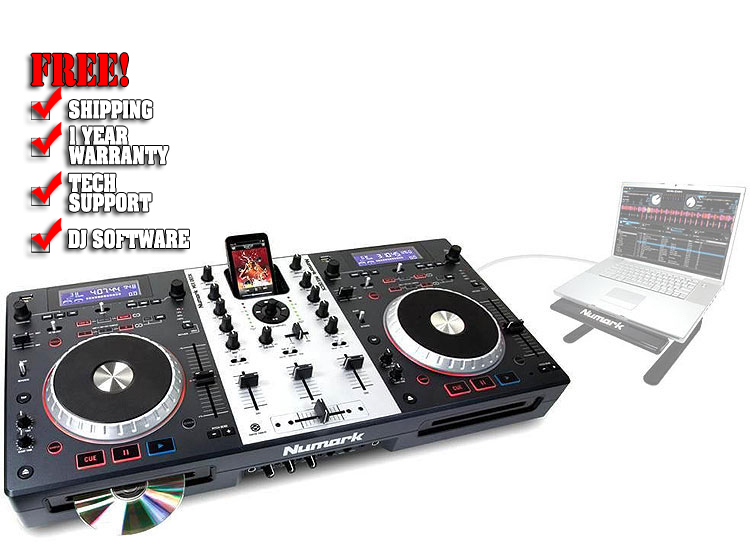 But these advanced decks aren’t just MP3/CD players – they also work as software controllers. Just connect MIXDECK to your Mac or PC with a single USB cable and you’re seamlessly controlling the music on your computer. MIXDECK’s MIDI communication enables you to easily map virtually any DJ software for direct connection from your fingers to software. MIXDECK has a full-featured mixer built in. Each input channel has its own gain and three-band EQ/rotary kills (+12dB/ -INF). The mixer channels control the audio from MIXDECK’s onboard players, incoming audio from your computer, or external sources such as turntables, MP3s players and more. MIXDECK has two sets of stereo, switchable phono/line inputs for external sources. MIXDECK’s replacable crossfader has switchable slope and reverse so you can customize its performance based on your preferences. On top of playing all kinds of music media, each one of MIXDECK’s decks enables you to add flavor to your performances with integrated, beat-synced DSP effects that include chop, echo, filter, flanger, pan, and phaser. Each is completely adjustable and a dedicated wet-dry fader controls them all.